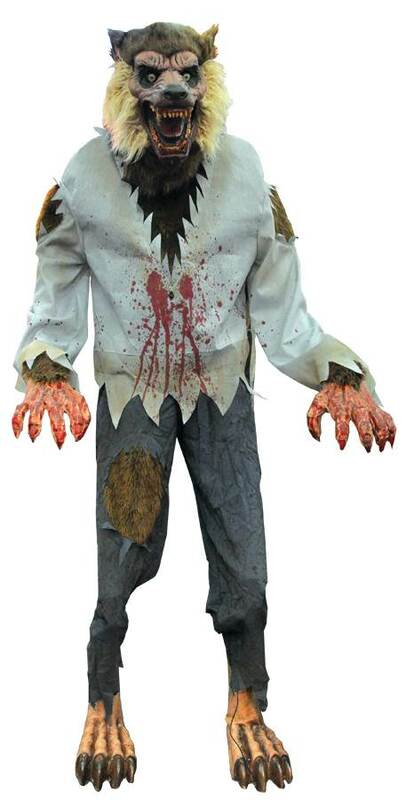 This Werewolf animated character is a must have for any of your Halloween events! He is 72" tall with and his head moves from side to side, he lunges forward at you and his arm raises up to grab you! Then he tilts his head back and howls at the moon! Prop has tattered shirt and pants, great sculpted head, hands, and feet, light-up eyes and a scary sound track that will give you goose bumps! The sturdy metal frame has motors attached. UL adapter and IR sensor with Step Here pad are included. Functions include: Steady-On, Try-Me, and Sensor modes. Recommended for indoor or covered porch use only.